Yesterday as nearly 2,000,000 signatures were delivered to the Government Accountability Board for the recall of Wisconsin Republicans Scott Walker, Rebecca Kleefisch, Scott Fitzgerald, Pam Galloway, Terry Moulton and Van Wanggaard, Dee Ives wept right along side us union thugs, dirty hippies and environmental extremists. Over 30,000 people spent the past two months in the middle of a Wisconsin winter collecting these signatures to make history. So why was Dee any different than the rest of us? Today, there were tears in my eyes as I watched boxes of Recall petitions being carried into the GAB office in Madison WI. Over 1,000,000 Wisconsin citizens gave our Governor Scott Walker a peoples referendum on his TEA Party Budget and theft of open and transparent politics in Wisconsin. For, you see, I am a Wisconsin Republican, and have watched with horror as the TEA Party infiltrated our Party of Lincoln, LaFollette, Reagan and Thompson turning it away from exactly what we in Wisconsin stand for … Progressive People-Powered Democracy. I was at Walker’s Inaugaration, heard him say he would uphold the Wisconsin Constitution and her Laws, that he worked for her people. As SEIU Republican Advisory Committee member for Wisconsin, I asked my union to give him a chance to be educated on the values of our proud Wisconsin Idea of Democracy and Union heritage. I offered our nursing expertise to bring down the cost of Healthcare, to show ways to cut costs and improve the quality of care we can offer our patients, our fellow citizens. Then came the Budget Repair Bill in February. I spoke at the first two rallies in February, in solidarity with WEAC , AFSCME, and many others on how this would affect our State, our veterans care, our communities. I stood in front of over 50,000 and explained this was not a Republican stance … after all, our party’s 1st President, Abe Lincoln had said “All that serves Labor, serves the Nation” and “There is no America without Labor, and to fleece one is to rob the other.” I was aghast that anyone would try to end Collective Bargaining, a law that passed in Wisconsin the year I was born, without even sitting down with our State Employee Unions to negotiate! It was the Law and our Gov was ignoring it. Then came the infamous “Koch call” where he compared himself with Reagan. We Naught-TEA Republicans believe in the right to speak freely, to bear arms, we support Labor and business, and insist that the government not interfere with our day to day operations of private organizations. We believe we should not have to choose between our party, our union, or our guns … yet our new Governor was choosing to try to make us a right to work state like Texas! I was appalled as I watched our Senate, lead by Scott Fitzgerald, break the open meetings laws we had in Wisconsin, despite Peter Barca’s pleas, to illegally pass Act 10 as our brave Wisconsin 14 were in Illinois. But it was just the start of the daily assault we in Wisconsin found ourselves faced with. The politicizing of our Department of Veteran’s Affairs, wanting to cut educational funding by $800 million, raising taxes on our working poor and seniors by cuts to EIC and Homestead monies, wanting to sell State assets without a bidding process, Voter ID—every day we watched our 1st Amendment right to free speech being curtailed, locked out of our house, the Capitol, despite court orders. We started the Senate Recalls , and many said we failed, but two of those TEA Party fake Republicans were ousted … and all three Democrats won back their seats. 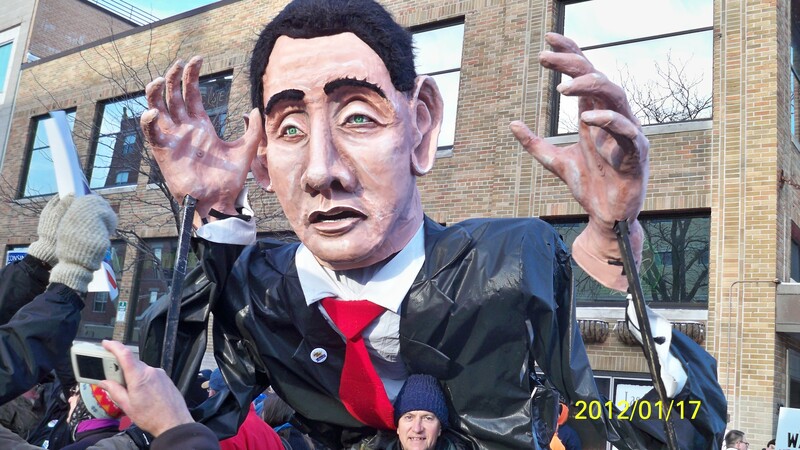 When Walker says “It’s working in Wisconsin” … he lies. We have lost jobs every month since his reforms, despite his corporate tax cuts at taxpayer expense. We have lost our trust in honest and fair elections via electronic voting machines, and we do not believe that the Paul Ryan plan on the Federal Level is a direction we want our party to take … it’s not our parents Republican Party, but rather a TEApublicCON ! Walker said we were broke … if that is how a State Budget should be! Balancing a Budget means all the tax money taken in is spent … or we are paying too much into our taxes. We will always strive to be “just broke,” but in Wisconsin the corporate tax breaks will cost over a billion dollars in revenue over the next decade … we can not afford this! So I joined the We Are Wisconsin team last summer, a non-partisan group. One of the things we were concerned about was the voter ID bill, especially as many seniors in nursing homes, including many of my fellow veterans do not have access to the documentation to get these IDs so that they can vote in 2012. As I collected my 316 signatures to recall Walker, and 310 signatures for Lt Gov. Kleefisch, I finally, almost a year later, got to meet our Governor. When I did, I told him of our Republican concerns of what he was doing cutting BadgerCare. Then my boss told him I was a veteran. So I asked him “Will you give the gift of assurance that all of the Veterans living in our State Veterans Homes will have the free photo ID so they can vote in the next election?” and I reminded him we Veterans all served to protect our Freedom and Democracy. Gov Walker stuttered a “Well, uh” … and he was moved very quickly off my unit without answering. Six veterans were outside, denied the chance to hear him speak, by the State Patrol at the doors. We will do well to rid ourselves of this TEA Party in Wisconsin … no real Republican would EVER dare take the right to participate in American Democracy by not providing the very heroes who risked all in service to America the means to vote! And with the FBI John Doe probe stating that the Operation Freedom charity funds embezzled by Tim Russell (who Walker appointed as Milwaukee County Executive to safeguard the money) being used by this person to pay for Walker for Governor websites, I also say no real Republican would ever condone stealing from our nations heroes either! Wisconsin is better than this, and if 1,000,000 signatures does not prove it nothing ever will! Governor Walker … do not bet that we rural Naught-TEA Republicans will be fooled again ! This is a woman who deserves a much better platform for her voice, either her or a similar Republican should step forward to make the case in a GOP primary. In Arizona is wasn’t a progressive who ousted their “king of the tea-party” state senate leader, it was a moderate republican with a history of good faith cooperation. Thank you Dee, for sharing this with everyone! You are one of the Republicans we feel we share common ground with!